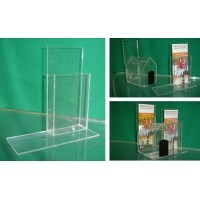 The Dog House Donation Box is built from a strong clear acrylic material. Each Dog House Donation Box comes with a lock and 2 keys allowing secure storage for collected items. The back side of the Dog House Donation Box has a Sign Holder, for displaying a campaign message or other visuals. Please select if you want the "Front Black Door" or if you want a "Clear Front (No Black Door)" on the right. By default, Front Black Door are selected if there is no option chosen. 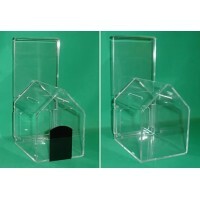 Please call 1-800-878-6144 if you want to purchase a large quantity of these Donation Boxes. 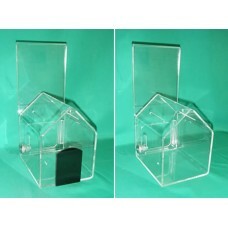 DJ-201, Dog House Style Donation Box, Economy This Economy Dog House Style Donation Box, is built f..
DJ-210, Medium House - Donation BoxThis Medium House Donation Box was modified from our regula..
DJ-400Add-On Brochure Holder for DJ-200 and DJ-201 Donation Boxes. 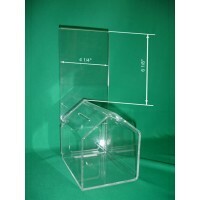 Designed to hold tri-fold brochu..